Administrators of the Bucyrus E and H .50 Auction site on Facebook are looking for a permanent location for their bi-weekly mass meets. 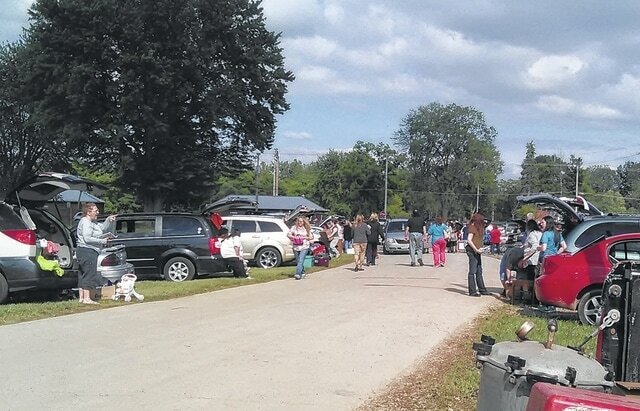 BUCYRUS — What began as a way for a couple to earn extra money for a family vacation has turned into a popular auction site on Facebook and a mass meet that continues to grow. Heather Lohr Burton and her husband started the site, Bucyrus E and H .50 auction last year. “We brought in a few administrators to help us out. Amy (Eulett), Gary, Karen and Jason have been great assets to the group and administration team. We couldn’t do it without them,” said Burton. There are several rules to follow when using the site but the premise is pretty simple: An item is placed on the site with a photo, a bid ending time and date and all sales must be honored. Bids begin at 50 cents but can go up in whole dollar amounts. Most sellers opt to meet their buyers at one of the bi-weekly mass meets. “The group grew so large that people were constantly meeting everyone, even multiple times a day, so we thought it would be easier to deliver and pickup at one big meet. We originally were meeting in the old Save-A-Lot parking lot, then the old Knights Inn but everyone wants a large fee to hold our meets,” Burton said. The mass meets are currently being held on Tuesday and Sunday evenings at the Bucyrus Soccer Field. “The mass meet is a safer option than meeting alone. Heather and Eddie’s site has given many people great bargains. Being a member of this site is rewarding on many levels. They’ve created a way to buy and sell online that is fun, friendly and exciting. Not to mention addictive,” Eulett said. Margaret Powers buys and sells on the site. “I use the auction site to get rid of items that I have sitting around my house that I no longer use or need. I like the idea of posting your items online instead of setting everything up for a garage sale. You just put pictures out there and wait. It saves a lot of time and work. This also helps people by giving them a chance to buy things cheap or to add to their collections. And it is easy recycling while putting a few bucks in your pocket,” Powers said. Ashley Baird is also a buyer and seller on the site. “I use Bucyrus E & H .50 Auction because it’s well-structured by the administrators and a quick way to sell items that I’ve been keeping around unused for a while and to buy alternative things I want. It’s less time consuming and overall more convenient to shop from your phone, especially if you have a hectic schedule or a disability. Most of the time if you win a bid, you’re paying far less for gently used items than what you would retail or even at a garage sale,” Baird said. Baird said she goes to auctions with her grandfather so she is familiar with how the auction system works. “On this site, we usually keep our auctions open for a week to allow ample time to achieve an appropriate bid. Sometimes an item sells for less than you thought but it’s a lesson learned and you also don’t have that item sitting around anymore. Mostly the amount of money I make selling pays for items I’ve won so I break even or come out ahead,” Baird said. Baird said the mass meets provide an easier way to pick up items won. “If you’re both buying and selling, it’s handy to have someone with you to either sell from your vehicle or use as a runner to go pick up your winning items. We have found that kids enjoy picking up the items because it’s like a treasure hunt to find people. The whole family can be involved that way and we have a lot of fun. We’re a large group of devoted auction junkies who meet up regardless of weather or temporary lack of a meeting place. I would say the bulk of us would agree to take up a collection, even if it was $1 per person, to donate back to community organizations,” Baird said. Burton, Eulett and the other administrators of the site are currently looking for a permanent mass meet site that will accommodate at least 100 people and vehicles. “We would need a parking area that would accommodate at least a hundred cars each meet- and that will continue to grow,” Eulett said. Burton can be reached at 419-561-7664. The auction site’s Facebook page is located at www.facebook.com/groups/613684702079784. The Positive Seekers are gearing up for their first annual Red, White and Blues event from 1 to 7 p.m. on July 5 at Aumiller Park. The event will feature music by Fat Daddy’s Blues Band, Dave Miller, Feint Night, Juvenile Mindset and Black Lounge along with face painting, discounted admission to the pool, food free of charge, entertainment, historical reenactors, classic cars, motorcycles, DARE, safety vehicles, face painting, community information and tons of other activities. “We wanted to host an event for families that they can come to without having to worry about what’s in their pocket. The event is free and open to the public,” said Positive Seekers president Joe Graham. Founder Carolyn Shireman said her group is still looking for street performers, clowns, magicians and others to entertain local kids and their families. “We have received a lot of sponsorship from local businesses. This is definitely a group of effort of many. We just want to bring fun to Bucyrus and put smiles on people’s faces,” Shireman said. Graham said the group is also working to secure a petting zoo for the event. For more information, call Graham at 419-569-4177 or Shireman at 419-689-2761.